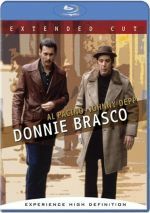 A factually based entry from 1997, Donnie Brasco seems similar on the surface but it offers a somewhat different look at "the life". The story follows Joe Pistone (Johnny Depp), an FBI agent who poses as jewel broker Donnie Brasco in an attempt to gain intimacy with local Mafia. After he gains the trust of semi-unsuccessful low-level gangster Lefty Ruggiero (Al Pacino), Pistone accomplishes his goals, but almost inevitably, he gets too close to the action and a variety of conflicts arise in regard to his position. Instead, the film concentrates on Donnie's relationship with his new compatriots, and it's through those elements that Brasco gains its power. Although the story itself doesn't do much to flesh out these connections, the actors make the developments compelling. Thankfully, Pacino almost totally buries his usual outsize bluster as Lefty. This guy's a not-too-bright loser who can't ever get ahead, and Pacino plays him with sweetly sad resignation and simmering fury. I wasn't sure someone of Pacino's stature could lower himself to the level of such a pathetic character - all those years of stardom and power must have had an effect - but Al does quite well in the part. He makes Lefty a believable and real person. Depp works just as well as the conflicted agent. He ably portrays the dilemmas faced by the character, and he also slowly develops the way Pistone disappears and becomes Brasco. Depp doesn't offer a quick and rough imitation of a wiseguy. He gradually transforms to the point where little of Pistone exists, even when he's out of that situation and home with his family. Depp seems versatile and solid in the role. The movie backs the two stars with a more-than-competent supporting cast, led by always-scary Michael Madsen and comic yet still realistic Bruno Kirby. 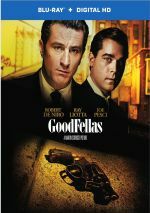 This group doesn't quite match up with the stellar cast of GoodFellas, but they do well nonetheless. Truth be told, Brasco occasionally feels like GoodFellas-lite. The stories move along somewhat similar lines, and a lot of the situations looked much the same. The main difference - and one of the more interesting aspects of Brasco - stems from the fact it concentrates on a pretty unsuccessful side of the mob. These guys don’t live the high life, unlike the Mafia characters we usually see. Instead, they slink along from one low-level caper to the next while they continue to dream of the big score that seems to evade them. It's an unusual perspective that adds power to the film. As does the true-to-life basis of the movie. Although Brasco takes liberties with the facts, it's still a strong subtext to know that the story really happened. It's hard not to marvel at the devotion of Pistone and all the work he puts in to his undercover job, and the knowledge that a real guy actually did what we see makes it seem even more amazing. Ultimately, I can't say that I love Donnie Brasco, but it provides an interesting and unusual look at a much-filmed subject: the Mafia. The film succeeds mainly due to some strong acting and a compelling story. Brasco becomes a worthy addition to the genre. The big question: does this extra 20 minutes of footage make Brasco a better film? The big answer: no, not in my opinion. Many of the elements seem interesting, but I can’t say that any of them offer anything particularly consequential. Usually they’re too short to do much, and some come across as redundant. We can already sense the tensions as Donnie rises in stature while Lefty stays the same, so we don’t need these spelled out to such a degree. Nonetheless, I can’t say that the additions actually hurt the movie. They get a little repetitive, but they’re not harmful in that regard. Both cuts of the film work well. I’d probably prefer the theatrical cut, as it’s tighter and brisker, but this extended edition gives us an interesting alternate view of the flick. Donnie Brasco appears in an aspect ratio of approximately 2.35:1 on this Blu-ray Disc. Though this release came out early in Blu-ray’s existence, it held up pretty well. Sharpness usually came across as crisp and detailed. Most of the movie offered a picture that was accurate and lacked softness, though some of the wider shots appeared a little fuzzy. I noticed no jaggies or moiré effects, but I saw light edge enhancement at times. Grain could be heavy, but I witnessed no issues with source defects. Except for the Florida segments, Donnie Brasco used a pretty restricted palette. As befit the lives of low-level gangsters, we witnessed lots of browns and blacks in the film. What colors we saw - usually neon reds and oranges - looked fairly accurate and well-reproduced, and when the palette became broader in Florida, the variety of hues came across well. The hues fit the design. Black levels were usually solid and deep, and shadow detail seemed appropriately heavy without excessive darkness. Ultimately, Brasco provided an appealing picture. The film featured a decent but generally unspectacular Uncompressed PCM 5.1 soundtrack, and the soundfield for Brasco seemed heavily oriented toward the front channels. Those speakers displayed audio that spread nicely across the forward spectrum and blended well. This meant the front channels appeared lively and active. The surrounds were much less involving, however, as I detected adequate use of music from the rear, and occasionally some effects cropped up back there as well. I heard light ambiance and also some loud reinforcement of a few gunshots. However, the track stayed strongly to the front, and the surrounds appeared to be junior partners in the mix. Audio quality seemed generally solid. At times the dialogue came across as a bit artificial, but speech usually sounded distinct and crisp, with no problems related to intelligibility. Effects were clear and accurate, and on occasion they seemed powerful. For example, whenever we heard gunshots, they appeared appropriately loud and accurate and they showed no signs of distortion. The effects offered decent bass response, but the best examples of low-end came from the music, especially when we heard pop songs from the era. As a whole, the score appeared clean and bright, and it provided pretty good dynamic range. The whole package worked well enough to merit a "B". How did the Blu-ray compare to the 2007 DVD edition? Audio showed a little more range, and visuals appeared tighter and smoother. This turned into a satisfying upgrade. The Blu-ray includes the same extras as the 2007 DVD. Donnie Brasco: Out From the Shadows offers a 23-minute, 52-second piece with circa 2000 interviews with director Mike Newell, writer Paul Attanasio, producer Louis DiGiaimo, and the real-life Joe Pistone. We also get 1997 snippets from actor Johnny Depp. While much of the information is good, the program becomes especially compelling due to the details from Pistone. His remarks give us a lot factual information we want to hear. All in all, it's a solid little documentary. We also find the film's Original Featurette. This program runs for seven minutes, 23 seconds and offers snippets with Newell, Depp, Pistone, and actors Anne Heche, Bruno Kirby, and Michael Madsen. Although it clearly offers a promotional view of the movie, it's a decent little program that provides a modest amount of interesting material. It's mostly valuable due to the inclusion of the actors' interviews. These aren't great clips, but since we hear so little of that side of things in the other featurette, the snippets add to the value of this minor but watchable piece. Brasco includes a Photo Gallery that runs as a regular video program. Various shots are filmed and shown onscreen as audio from the film and from the set plays alongside them. This piece lasts for three minutes, seven seconds and it offers a nice way to show these pictures. A few ads appear under Previews. We find promos for Casino Royale, The Big Hit and SWAT. Like the 2007 DVD, this set loses some extras that appeared on the 2000 Special Edition DVD. It drops Newell’s commentary, an isolated score, “Talent Files”, the movie’s trailer, and a booklet with some production notes. Though both include “Previews”, the two discs provide different ads. Donnie Brasco won't go down as one of the great Mafia-oriented films, as that's a crowded field and it simply lacks the consistent power to qualify it for such honors. However, it's a consistently solid and interesting movie that concentrates on a side of "the life" rarely seen in such programs. The Blu-ray boasts generally good picture and audio along with a few supplements. The continued absence of some old bonus materials disappoints but this becomes the best presentation of the film to date.